Vote forDaylesford, VICTop Regional Destinations Which are Australia's must-visit destinations? You help us decide. With a focus around relaxation and getting back to nature, the area around the sister towns of Daylesford and Hepburn Springs features Australia's highest concentration of natural mineral springs – in fact, 80 of the 100-some springs in the country are located here – and, as a result it has a well-served reputation for being a hub of pampering for couples and solo travellers alike. While Australia's not typically a country closely associated with geothermal activity, the heart of Victoria's “spa country” offers a surprising experience to the uninitiated. The fact that Daylesford lies just over an hour to Melbourne‘s northwest doesn't hurt in terms of accessibility, either, and it's become a top getaway spot from the city over the years. There's an incredibly large selection of therapies and treatments all within an easily navigable radius here, an area that is also densely populated with spa resorts and B&Bs to accommodate visitors in pursuit of the region's healing and restorative properties. Everything that makes Daylesford a worthwhile spot to visit begins with the excellent quality of water in this part of Victoria; it's the home of famous bottled brand Mt. Franklin, and even the tap water simply tastes “fresher” than that of the big cities. Likewise, the waters visitors can immerse themselves in are rich in a number of minerals such as magnesium, silica and calcium that are long believed to have rejuvinative effects for the skin and recovery for aches and muscle pains. Combine these with additional treatments ranging from mud baths to massage, and those couples looking for shared indulgence will be in their element here. The relaxation element of the Daylesford/Hepburn Springs duo is augmented by its added mixture of history and architecture; there's been a strong Swiss-Italian influence in the region since the 1800's, and multiple Eurocentric buildings dating back to the 1850's incorporating elements of granite and sandstone remain in good condition to this day. The natural backdrop to all of these goings on is equally pleasant, as there's plenty of natural bush scenery to navigate at leisure, while a simple stroll around Lake Daylesford itself is a tranquil spot for a hand-in-hand walking experience. The valleys of the Macedon Ranges also make for an impressive panorama that can be viewed on the tail end of the drive from Melbourne, or by heading further afield and visiting the summit of Mount Macedon itself. Daylesford also brings along with it an excellent balance of accommodation and restaurants to go along with its relaxation-oriented attractions, with many of them quiet and secluded – there's a number of cottages off the main bridging area between Daylesford and Hepburn Springs in particular. Choose from top spa resorts, B&B's and other boutique accommodation including the Samadhi Health and Wellness Retreat (an Eastern-themed devotion to peace, tranquility and recovery), the Lakehouse (a high-end combination of accommodation and dining in a single spot overlooking the water), Kudos Villas (a blend of sophisticated seclusion and individual “themed” villas based around the elements), and 65 Main (a guesthouse dating back to the 1800s overlooking the forest). The Daylesford/Hepburn combo makes for an excellent choice for Melbournian couples looking for a relatively underrated destination that's well within reach either for a day trip or overnight stay, with weather that generally trends towards less wet than Melbourne city, too. Looking to pay a visit to Daylesford but not sure what to do? Here are a few of its most essential experiences. What's new in Daylesford in 2016/2017? The region has launched a new focus towards "destination weddings" due to its natural appeal for couples to host their special day. 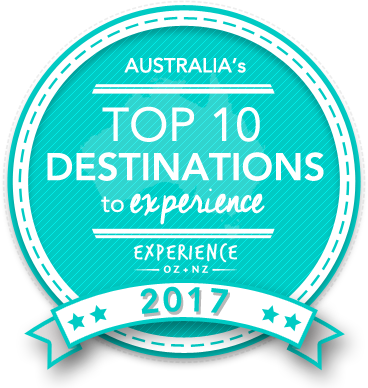 Is Daylesford Australia's Top Regional Destination to Experience for 2017? Vote now for the chance to WIN an epic trip to one of Australia's top destinations!